Summoning a spirit like Belphegor may be intimidating, but not to the young lady in this short 3-D animated film by Phillip Simon and Alyse Miller for a thesis film. Best. Art School Film. Ever. I just received my copy of “Concourse of the Watchtowers: An Exploration of Westcott’s Enochian Tablets” by Tabatha Cicero. While I must admit I’m not finished with it yet (I don’t get as much time to read as I’d like), so far I’m highly impressed with the content so far. Kudos to Tabatha for making this information public. The book itself contains an explanation of what the Tablets are, and how vastly they differ from the “standard” Golden Dawn Enochian Tablets. It shows detailed explanations of each square in the tablet, what each sub-sector contains, how it relates to the Laws of the Convoluted Forces (with some great stuff by the noted Kabbalist Olen Rush), and some brand-new material by Innes, Farr, ThAM-level workings, and even a previously-unpublished 6=5 ritual. Needless to say, this isn’t an entry-level book on the Golden Dawn. One should be intimately familiar with the 5=6 material given in Regardie, and have practiced it for quite a while in order to get the most out of this book, but like others on the market right now (like Pat Zalewski’s “Golden Dawn Rituals and Commentaries”), it’s great to see advanced publications come out of the GD, rather than the fluff that seems to permeate the market. Oh, and did I mention I received a copy signed by Chic and Tabatha? Get it now! A statue of the god/goddess/angel you wish to work with. A full sheet of 1/4″ plywood (though a 2′ x 4′ piece would probably work as well). A good saw (electric handsaw or preferably a table saw). 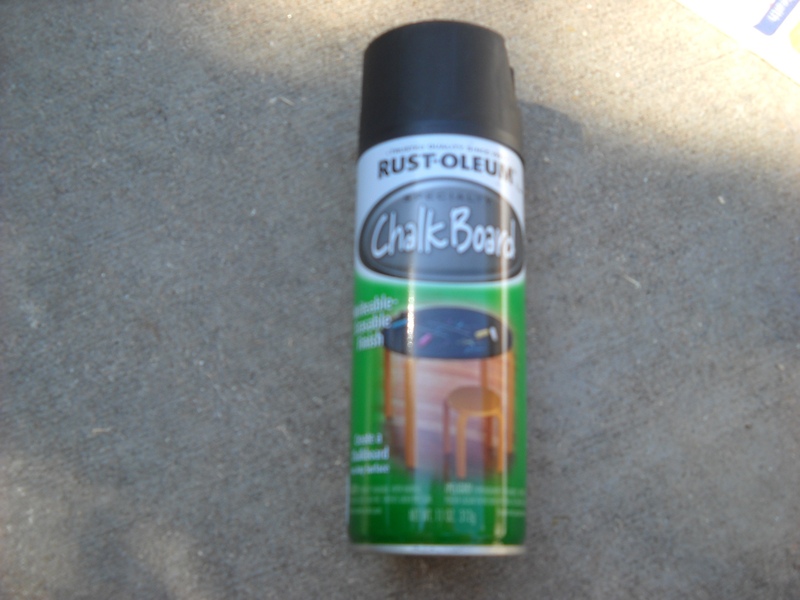 Black (or whatever color you desire) paint OR Chalkboard paint. 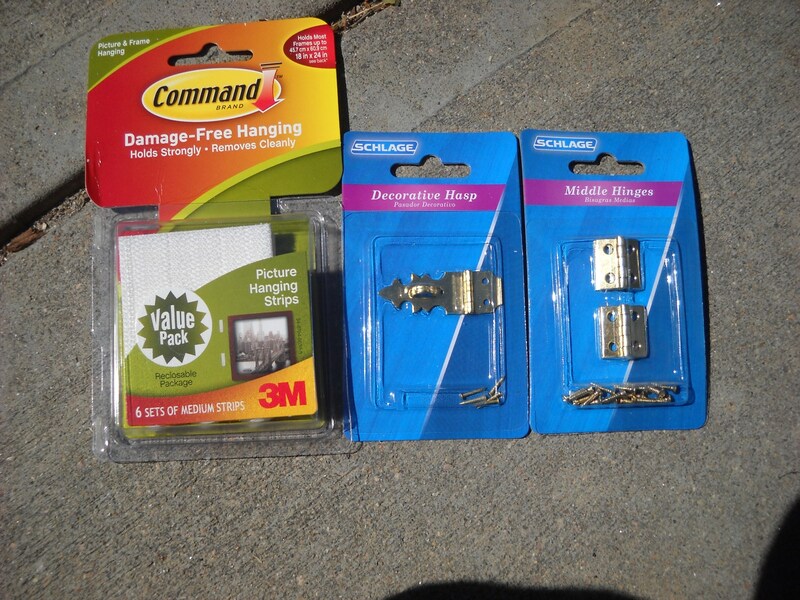 Some hinges & a lock, as well as a means to place the box on the wall of your room. Measure the width, height and length of the statue. 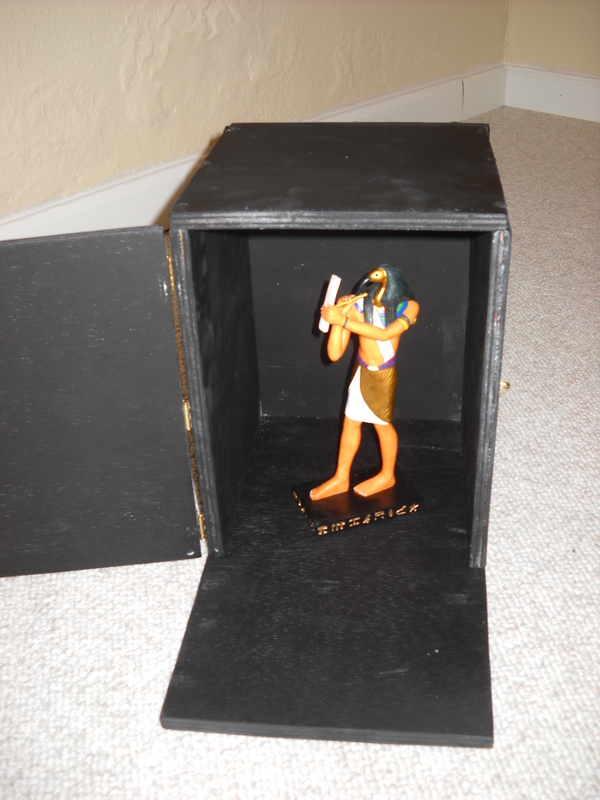 My particular statue of Thoth is small, only 8″ tall, 3.5″ long and 2.25″ wide. 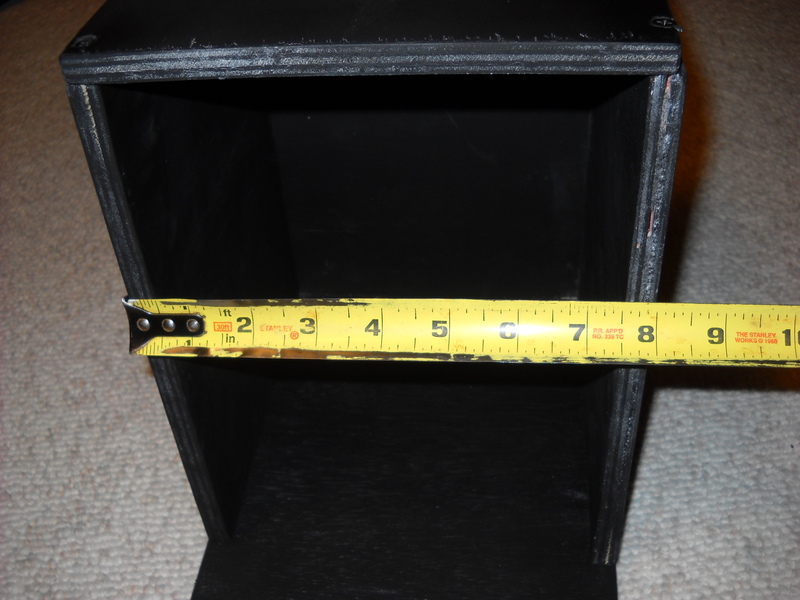 Add approximately 2″ to each measurement. 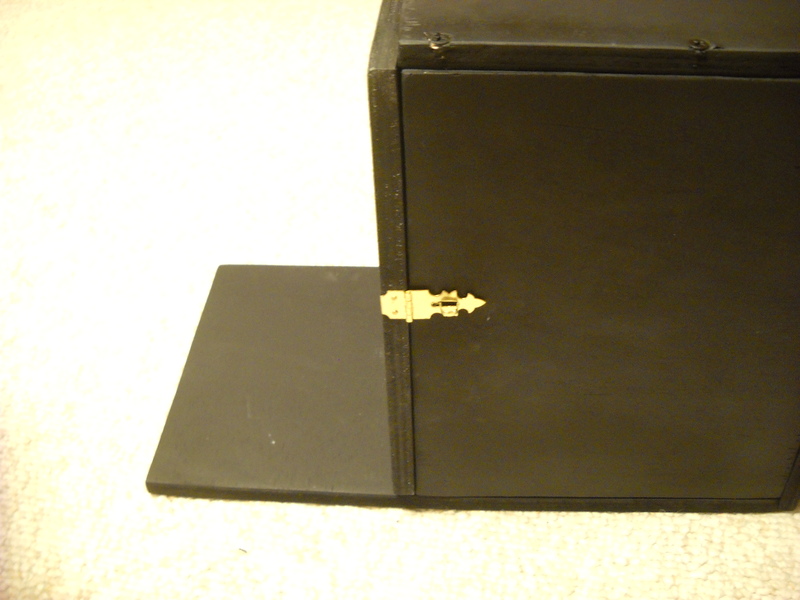 For the base of the box, add about 6″, making a space for sacrifices. Cut your lumber (be careful!) to the measurements. Ignore the door for now. Sand the wood with a medium-grade sandpaper, then a fine-grade paper. Dust off the wood and prime all sides (be sure to prime and paint in a well-ventilated area!). Once the primer is sufficiently dry (usually within an hour for most primers), sand the primed wood again with a fine-grade sandpaper. 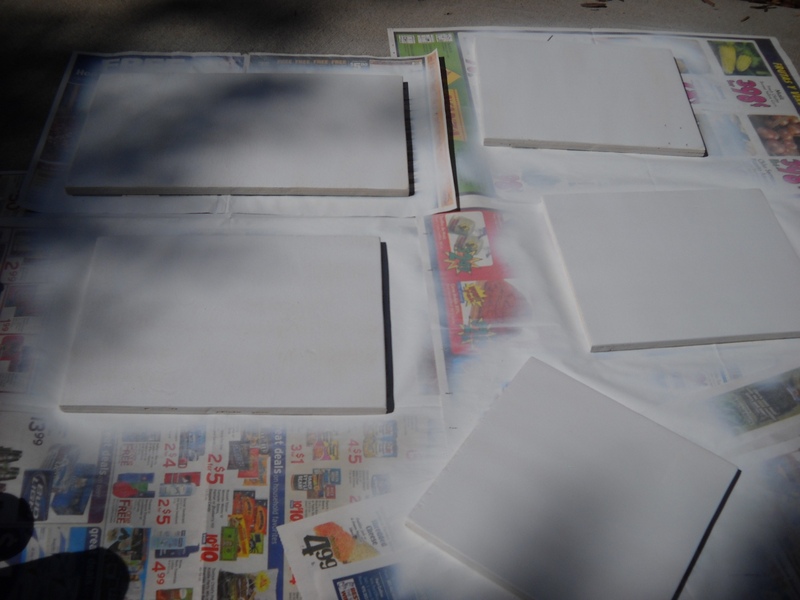 Paint the primed wood with the appropriate colored paint. 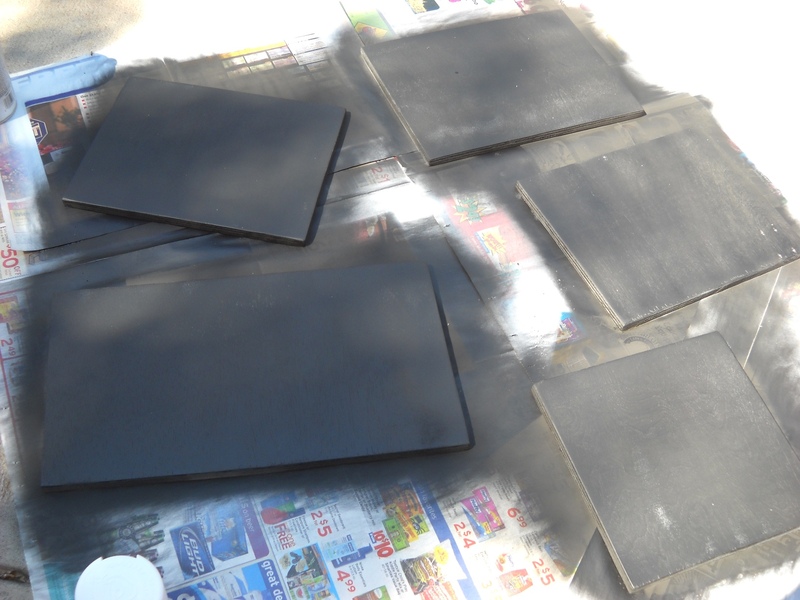 Instead of making one box per color (and thus per god) I wish to work with, I used chalkboard paint. I can then use the appropriately-colored chalk to paint the name of the god as well as any sigils I wish around the inside & outside of the box. Apply a second coat of paint. You’ll likely not have to do this if you’re using chalkboard paint, as it covers primer very well. 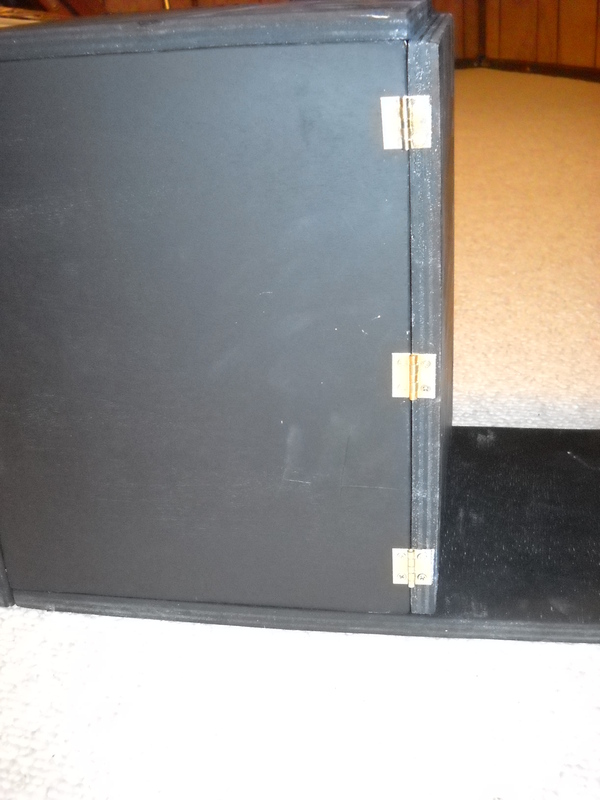 Nail or screw the box together with finishing nails or small screws. If screwing the wood together, you’ll need to drill a small hole where you’ll put the screw in, to avoid splitting the wood. If needed, paint over any points where the wood has shown through after screwing/nailing. 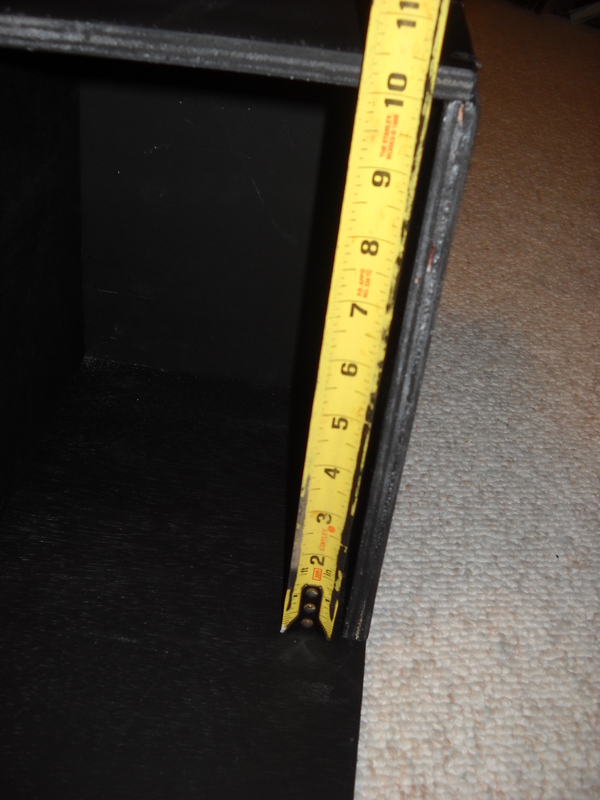 Now measure the inside front of the box, as shown here. This is the size of the door, which will cover the god from prying eyes. Cut, prime and paint the door. Attach the hinges & the lock. And now you have a house fit for a god! You may mount the box on your wall, so you can sit directly across from the god, as Tyson suggests, or you could put legs on the box. You can either leave the door open all the time, or shut it with the appropriate sacrifices inside with the god, opening it to commence worship or whatever you have in mind. Students come in all shapes and sizes. Some are true neophytes, unsure even what the Golden Dawn consists of, nor its long (and sometimes sordid) history. Others consider Temple work old hat, and have been in other groups, or lead their own, or belong to other Temples concurrently. The problem that exists for any teacher, mentor, etc. in a group where the teachings of one grade are separated from others is “how to juggle all these levels of students?”. Many groups separate meetings into sections, or have separate meetings for the various levels. Others just blend all the teaching together into the meetings, creating a hodge-podge of knowledge that denies the structure of the Golden Dawn’s teachings. But what do you do when you’re only meeting once or twice a month, need to rent space, and don’t have enough hours to separate groups of students? Often, the best recourse (at least that I’ve found) is to allow the higher-ranking students to help lead the Neophytes in their Knowledge Lectures, explaining, leading classes, or answering questions. This fosters the growth of the Temple as a whole, creating new teachers or mentors. You (and your “cohorts” for lack of a better term, and to continue the spirit of the Latin “Praemonstrator”) are then responsible for teaching those higher ranking students on their own, either in our out of the Temple itself. Modern technology greatly eases this pressure, and bulletin boards, email, Skype, etc. are great ways to engage everyone. Well, I’m in the final stretch of getting my gematria book published. To be honest, I’m excited and a bit nervous about it. The final graphics design are being done by a former coworker who’s work I greatly admire, and it should be ready this month. So keep your eyes open for an announcement here soon on where to buy it. The energies of expansion & contraction seem to make themselves most readily apparent throughout ritual, but I’ve been considering lately how much these energies influence membership in esoteric groups. It seems that some times of the year, people are more ready to start working with others. Our group currently has 4 people who are on a leave of absence, and we hope they come back soon, but meanwhile, many new members are applying. Despite Denver’s not-so-large population (almost 600,000), it does seem to have a large number of persons who are interested in esotericism. Often, these applicants are looking for a coven, or are interested in something that’s totally unrelated to the Golden Dawn, but every so often, a great member joins and sticks with the group through thick and thin. Of course, there are always once-offs who are initiated and never return, but I feel that the courage it takes to join a group is often enough weeding out (see my previous post about finding good members), so that these seem to be few and far between. There’s only so much prodding and encouraging that can help a student to stick with the path — so much of it depends on their willingness to follow through. For me, the rise and fall in Temple membership is like a wave – ride it, don’t fight it. Has anyone else noticed massive rises and drops in attendance/membership? And if so, how does your group deal with it? The Temple (or Lodge, or Order or whatever the official title) is no place for politics. This is the stance of the Temple of Thoth Amen-Ra, and is the stance of many groups I’ve belonged to or been associated with. But why is this? 1. When a potential member’s political beliefs could potentially be harmful to the group. Let’s take an extreme example of a potential member who could be refused entrance despite the non-mention of politics in the aforementioned section. Take the fictitious “Bob,” who feels that whites are a superior race, and belongs to several neo-nazi organizations. There’s no way that I at least, could on good grounds, allow him entrance into our Temple. I don’t pretend to speak for other members of my Temple, but I can’t imagine any of them voting “Bob” in. This is for the simple reason that intolerance has no place in a magical order, especially one based on the Golden Dawn. I know however, that the Cipher Manuscripts state to “Avoid Roman Catholics. But with pity.”, but I feel these are more an outgrowth of the early Rosicrucian association with Protestantism. In most modern GD organizations that I am aware of, a Roman Catholic would not be denied entrance just because of their religious beliefs. 2. When mundane politics interfere with the Temple. This latter possibility seems far removed in the United States, where the founding fathers were masons, and the long and respected history of fraternal orders has existed in and with politics, but who knows what the future holds? The last time that fraternal orders were persecuted was the Third Reich, when approximately between 80,000 and 200,000 Freemasons were executed in the Holocaust (Wikipedia). I am unaware of the number of magical orders that were shut down, but most famously the OTO was persecuted. In a case like this, it would behoove the Temple to openly discuss the influence of politics on their group. I have no idea what the best course of action would be in this case, and hope I never have to deal with it. So, while I’m absolutely opposed to bringing politics into the Temple for personal or inter-Temple political ends, there are exceptions to the rule.